An initiative involving more than two dozen countries has put in place its working groups and has begun its effort to bolster international capabilities for verifying future arms control agreements, officials from the United States and non-nuclear-weapon states said in interviews and email exchanges over the past few months. 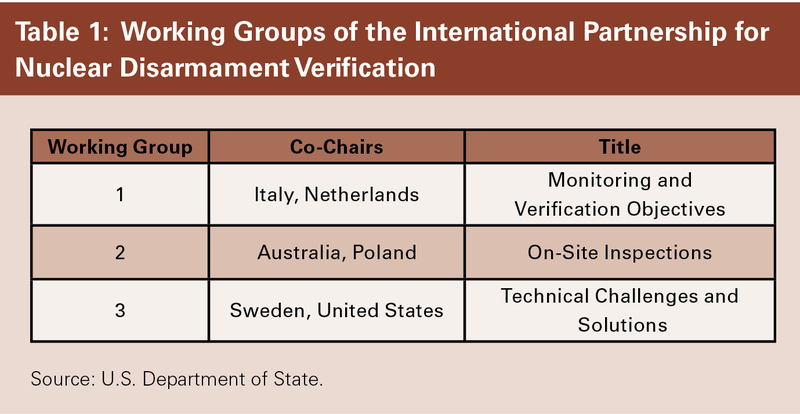 A key part of the effort is to expand and develop ways in which nuclear-weapon states can interact with non-nuclear-weapon states in pursuing verification issues. Since then, the partnership has held a kickoff meeting last March in Washington and a plenary meeting in November in Oslo, where it formed three working groups. The groups, which deal with monitoring and verification, on-site inspections, and current and future verification technologies, met in Geneva last month. In a Dec. 10 interview at the State Department, Frank Rose, assistant secretary of state for arms control, verification, and compliance, said the working groups are the “driving engine” of the partnership in its quest to “find technical solutions to future problems.” He said each of the working groups was open to all members of the partnership. Rose said the idea for the partnership came from a 2014 study of verification issues by the private Nuclear Threat Initiative (NTI). The study drove home the point that an array of countries, not just the ones with nuclear weapons, would have to work to improve international verification capacity to be prepared for future nuclear arms control agreements, Rose said. That led to a collaboration between the State Department and the NTI, he said. Andrew Bieniawski, NTI vice president for material security and minimization, participated in the Dec. 10 interview and emphasized that the partnership is an “action-driven, deliverables-driven, results-driven initiative,” pointing to the detailed requirements in the terms of reference for the three working groups. Rose said the partnership’s work is “all going to be done at the unclassified level” and that the goal is to publish the key documents online. In a Feb. 4 interview, Kurt Siemon, director for nuclear verification in the U.S. National Nuclear Security Administration and co-chair of the working group on technical issues, said the approach would be to “listen to the views of everyone in the room” rather than asking participants to “pick and choose from a menu” that the United States has produced. María Antonieta Jáquez, deputy director-general for disarmament in the Mexican Ministry for Foreign Affairs, said in a Feb. 16 email that the partnership “has provided a very good space” for dialogue between nuclear- and non-nuclear-weapon states. That, she said, “is very welcome” amid the widespread “frustration with the lack of progress in nuclear disarmament” by the nuclear-weapon states and the resulting “very divided” discussions on that subject. A central challenge for the partnership is that its mission is to develop technologies that will meet the needs of future agreements that are hypothetical. In the interview, Bieniawski said the “whole life cycle” of a warhead is within the scope of the partnership but that the partners had agreed that the focus for the first 18 to 24 months would be on the nuclear warhead dismantlement process and the monitored storage of the resulting nuclear materials. In their email correspondence, the members of key delegations gave varying degrees of weight to the technical and policy components of the undertaking. In his Jan. 29 email, Col. Marek Sobótka of Poland, co-chair of the group on on-site inspections, highlighted the interplay between the two aspects. The partnership is a technical exercise in that it is directed toward “finding practical ways for cooperation” between nuclear- and non-nuclear-weapon states to create a set of tools that is “ready to use” in designing and verifying “a new future nuclear disarmament treaty,” wrote Sobótka, head of the nonproliferation and disarmament policy division in Poland’s defense ministry. But he said that if the results of the partnership’s work are “properly presented,” they “will prove to the broad international community how complex and difficult” it will be to achieve the goal of nuclear disarmament. A question underlying much of the partnership’s work is how to carry out useful sharing that does not touch on sensitive information. In a Jan. 27 email to Arms Control Today, Piet de Klerk, ambassador at large for the Netherlands and co-chair of the monitoring and verification working group, said the ability of the group to navigate classification issues “is the crux of the matter.” A key question, he said, is, “What can you show to outsiders…so that they can draw credible conclusions about disarmament steps without violati[ng] classification rules?” As he noted, under the nuclear Nonproliferation Treaty (NPT), the nuclear-weapon states are prohibited from sharing information with non-nuclear-weapon states about making nuclear weapons. “Managed access” refers to a practice in which the inspecting party and the inspected party negotiate the extent of the inspectors’ access to sensitive areas. In the Dec. 10 interview, Rose and Bieniawski emphasized the work of a UK-Norwegian initiative on dismantlement verification. That effort, which began in 2007, is considered pioneering in the way it brought together a nuclear-weapon state and a non-nuclear-weapon state to collaborate on verification issues. In one of the exercises, Norway played the role of the nuclear-weapon state and the United Kingdom played the non-nuclear-weapon state, an example of the way the project was mutually beneficial and was able to navigate the classification issues successfully, Rose said. The international partnership is going to build on the UK-Norwegian initiative, but go “much deeper,” Bieniawski said. Asked about the members of the partnership, a State Department spokesman said in a email exchange last month that, in addition to the five countries that the NPT recognizes as nuclear-weapon states—China, France, Russia, the UK, and the United States—Australia, Belgium, Brazil, Canada, Chile, Finland, Germany, Italy, Japan, Jordan, Kazakhstan, Mexico, the Netherlands, Norway, Poland, South Korea, Sweden, Switzerland, Turkey, the United Arab Emirates, the Vatican, and the European Union have “attended the various activities” of the partnership. Some of the sources interviewed for this article indicated that China and Russia, at least officially, have hung back from full participation in some of the activities. South Africa, which built nuclear weapons and then, in the late 1980s and early 1990s, dismantled them and joined the NPT as a non-nuclear-weapon state, is not a member. The State Department spokesman said, “South Africa’s technical expertise and its own disarmament record would make it a valued addition” to the effort. Rose said the focus for the initial membership was countries that had expressed an interest in verification and could provide technical expertise. Some of the invited countries did not accept, he said. He said that, at the partnership’s plenary meeting last November, the countries did not come to agreement on the issue of membership expansion but agreed to discuss it at the next plenary, scheduled for June in Tokyo. Note: After this article was posted online, the State Department released information indicating that the Tokyo plenary will take place in June. The article has been updated to reflect that information.